We have a new challenge at Whimsy inspires this morning, we aren't doing the digi hop this month cause our challenge day falls on the day of the digi hop so we are just doing them together. The challenge theme for this month is "Anything Goes". 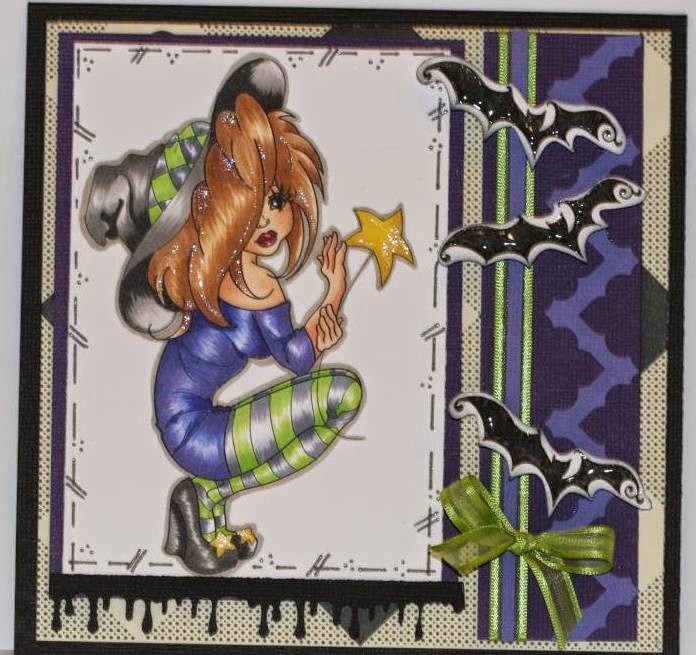 My challenge card for this month is using this great Halloween image called Wanda from designer Marika Collins from Whimsy Stamps. There are so many wonderful images being released from the Whimsy Store this month it was pretty hard for me to choose one to do for today. I hope that you decide to make a card and share it with us on this months challenge just click here to see all the other digital designers cards and find the link to add you card to the challenge for a chance to win some great digital images from the Whimsy store. 7 Kids College Funds: Anything Goes with a Twist of Ribbon or Lace. Supplies: Copic markers, Bazzill cardstock, Miscellaneous patterned paper, Martha Stewart gewy punch, Glossy accents, Stardust stickles from Ranger, Offray ribbon, Basic grey bat stamp. Cutie, cutie - nice coloring Happy Day! Awesome image and the layout is great, nicely done. Great added touch with the bats. BAM! has WOW! Fabulous coloring. Thank you for joining in our challenge at http://www.7kidscollegefund.com.